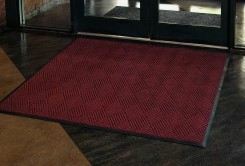 When you need an attractive floor mat that is also durable, Andersen WaterHog Fashion Diamond Mats provide the solution. 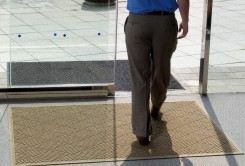 Combining the dirt trapping features of the sibling Classic matting, and needle-punched fibers, this entrance mat can match the décor of retail stores, offices, and other commercial settings. 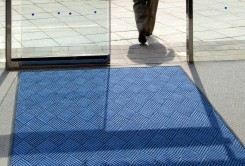 Constructed with polypropylene fibers, solution-dyed with outlasting light fastness, these Andersen mats won’t fade or rot from continuous exposure to outside conditions and/or moisture. Uniquely constructed, the Fashion Diamond floor matting traps dirt and debris, and keeps it beneath shoe level until cleaned. Cleaning is also very easy; a daily vacuuming will do most of the work. Rubber reinforced nubs are built into this Water Hog entrance mat to keep it in top-notch condition, even with all the heavy-traffic over the years. 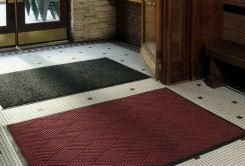 Andersen WaterHog Fashion Diamond Mats definitely fit the bill for keeping commercial areas clean and looking good. ASTM C 1028-29 Static Coefficient of Friction. 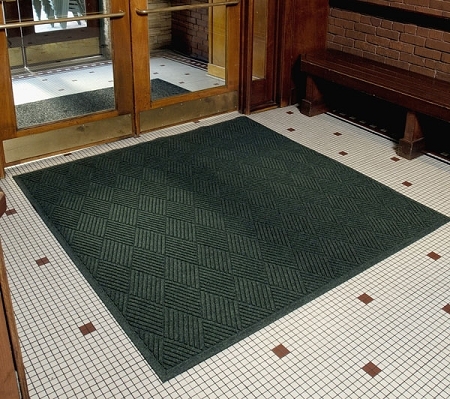 *Mats up to 40ft are standard Cleated Backing and available in Smooth Back on request. *Mats over 40ft are only available in Smooth Back. *Should not be used in areas exposed to animal fats (kitchens) or petroleum products. *Not adversely affected by salt or ice melt.